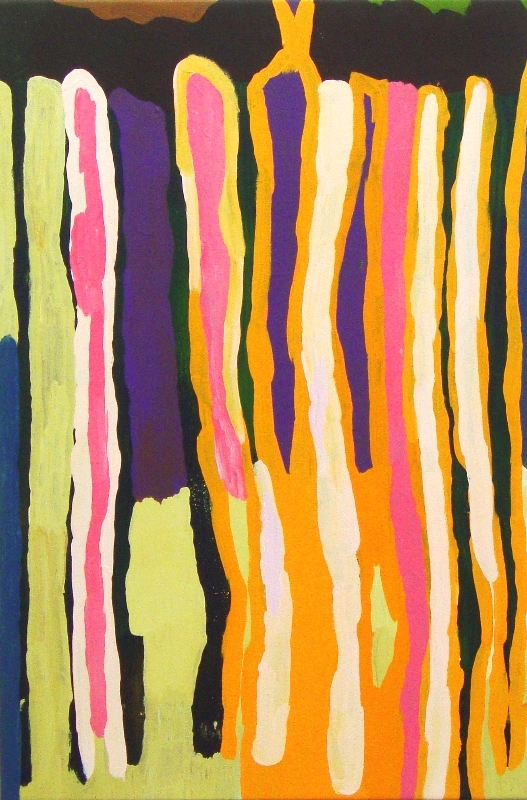 Lisa Uhl, Turtujarti 2012, acrylic on canvas, 120 x 240 cm. For Indigenous people, the visual activity of the landscape (the shimmer of a dried waterhole, shifts in light and color, blooms in Spring) are all tangible expressions of ancestral experience. They are the bridge between the phenomenol and noumenol worlds: the way in which the Dreaming is made visible. Recreating these visual effects is not about creating a representation of the landscape (as in a western landscape painting, which is always a copy of the “real” world), but rather, a re-enactment of the power of the Dreaming. As such, paintings become an active part of imagining country, participating in this transformational process, and giving them power to literally change the world! […] Despite their relatively short careers, all nine artists were extraordinarily mercurial in their artistic practice, experimenting, innovating and shifting styles with alacrity. This peripatetic drive stands to reason; re-energising the Dreaming was a full-time creative exercise: a life’s work.It is impossible to grasp the immensity of such a project from a single painting. Just like the landscape, which reveals its ancestral energy through constant change, the profound success of these artists must be measured through their own continued processes of innovation and transformation. 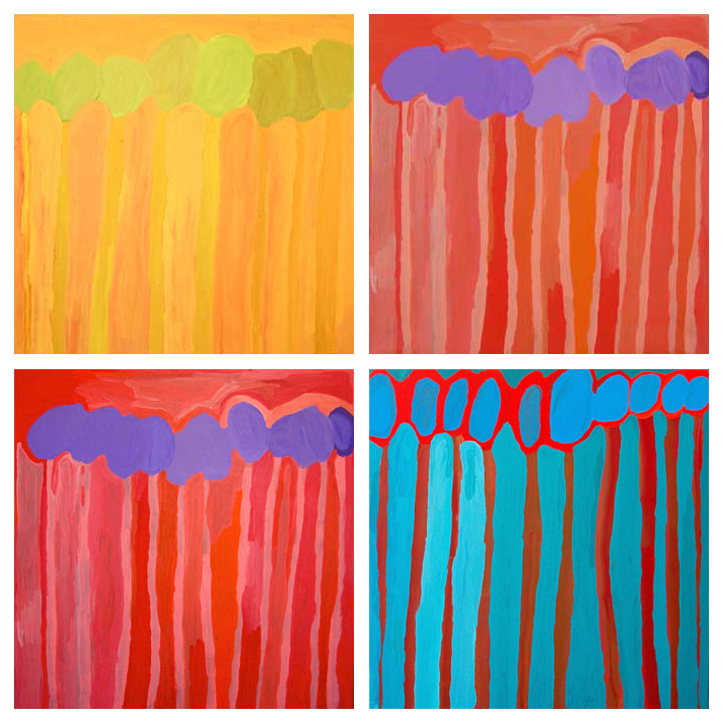 Lisa Uhl, Four versions of Turtujarti, 2012-2013, acrylic on canvas, 90 x 90 cm each. 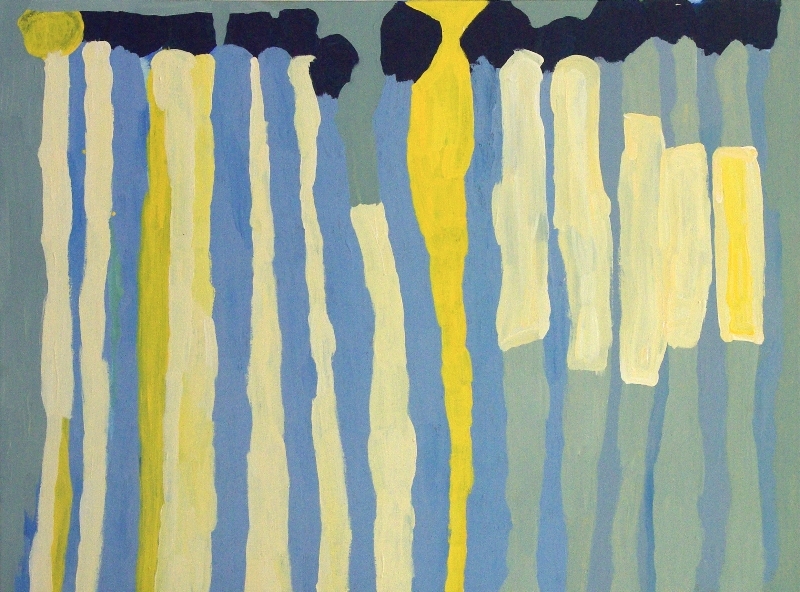 Lisa Uhl, Turtujarti, 2011, acrylic on canvas, 60 x 90 cm. 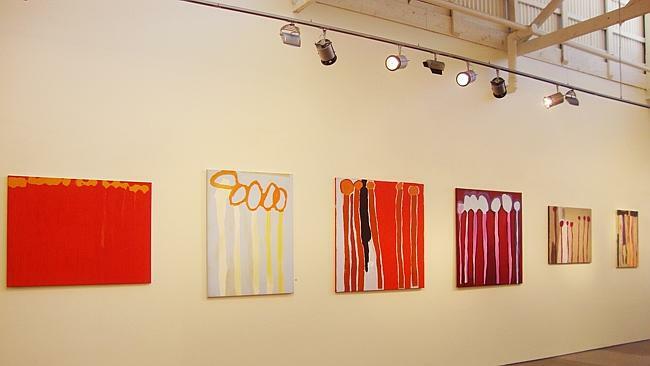 One artist we might consider is Lisa Uhl. I really admire Uhl’s paintings: they have a beautifully raw elegance that is deeply expressive, while speaking to a local art history. Along with the equally exciting, but slightly older Sonia Kurarra, Uhl is one of the rising stars of the Mangkaja Arts Resource Agency at Fitzroy Crossing. 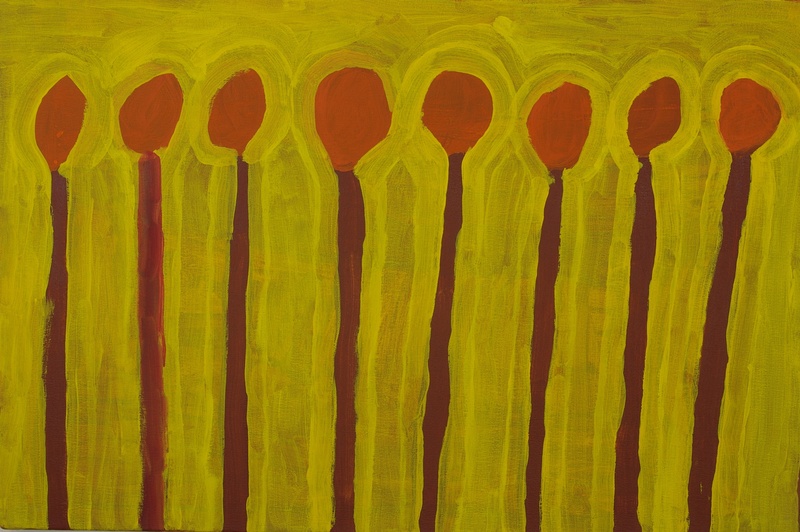 In her short painting career, Uhl (born c.1976) has clearly imbibed the influence of her aunt Jukuja Dolly Snell (who raised her from an infant), but has managed to find her own voice through her signature motifs of the Turtujarti (walnut trees from the Great Sandy Desert) and Kurrkapi (Desert Oaks). Uhl clearly does not tire of painting this limited repetoire of motifs (which, to be honest, are pretty much indistinguishable). But to call this a limitation in Uhl’s oeuvre, is like dismissing Mark Rothko because he only painted squares! 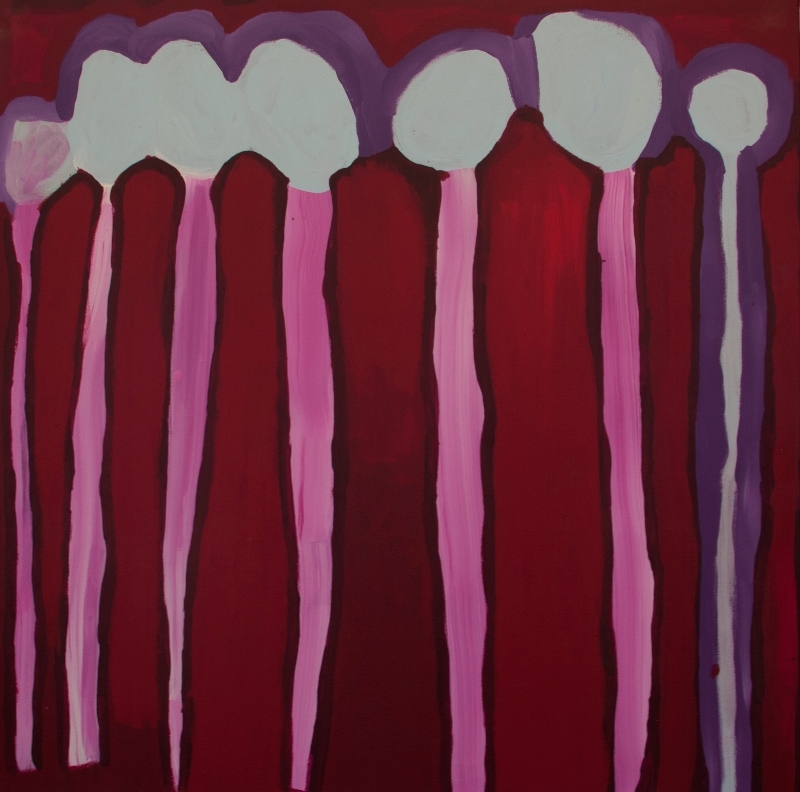 While it would be wrong to call Uhl a formalist, her paintings are similar to Rothko’s in the sense that their charge comes from their exploration of light and colour: a line of white against a mauve background breaks like dusk through the trees, or a halo of amber emits the pulse of a languid afternoon. 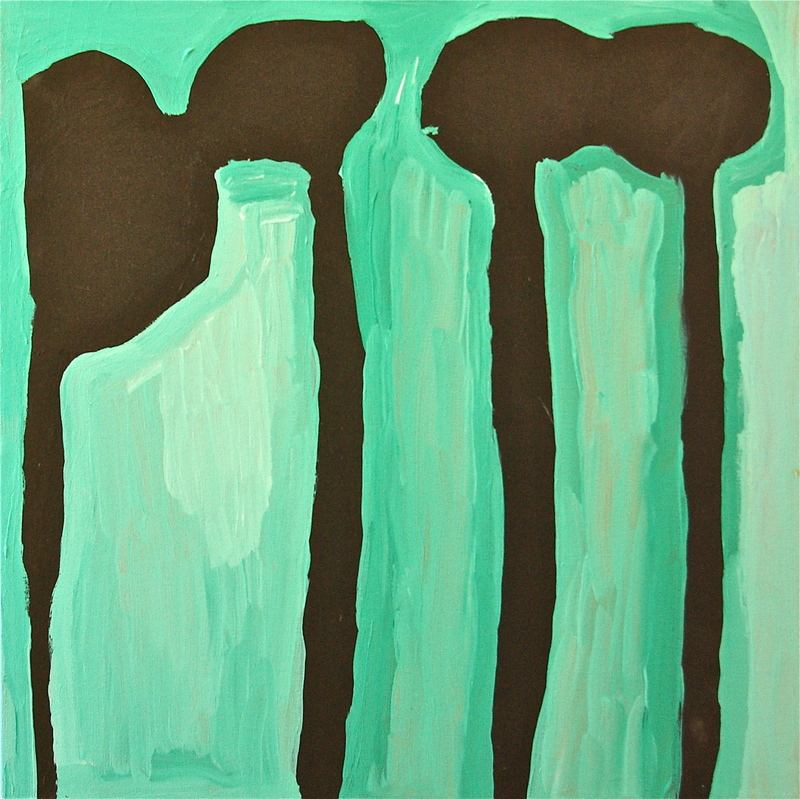 Lisa Uhl, Turtujarti 2013, acrylic on canvas, 60 x 60 cm. Sure, some artists tear through styles and motifs, but. Uhl is on a different track. In her works, the motif of Turtujarti works as the earthly bedrock upon which the transformational actions of ancestral presence take place. Her motif is the immutable landscape, but its power is revealed through the ability of its surface to change. Uhl’s practice is a beautiful metaphor for this process. Painting might be used to rejuvenate this ancestral power, but it cannot be at the expense of this mutability. Perhaps Uhl’s focus is also a sign of her youth, revealing a sensible trepidation not to transgress the bounds of her authority. As she becomes an elder in her own right, perhaps her practice will transform; but for now, I am happy to enjoy her patient meditations on Turtujarti and Kurrkapi.